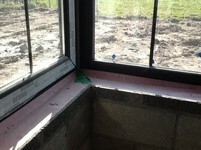 Clean Energy Ireland have introduced the widest window airtightness tape into the market. The newest Winflex-I product is 300mm wide and is suited for a range of difficult situations. It can even be successfully plastered over. Full product details are here. The pictures shows the Winflex-I being taped to the DPC and bonded to the blockwork, prior to the insulation, underfloor heating and screed is completed. Copyright © Clean Energy Ireland. All Rights Reserved.